Incredible view from the private deck of this townhome. 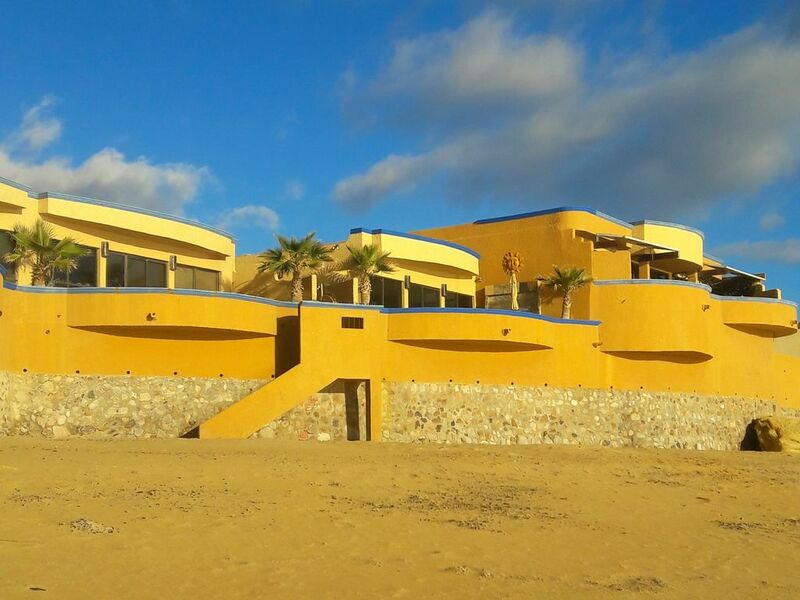 You won't find a better location in the town of San Felipe. Directly on the beach with private access to the sandy beach below. A retirement community, adults of all ages are welcome. This Condo is Tastefully furnished and private with unbelievable views. Make sure you have your camera, the sunrise and sunsets are amazing. Of course all the conveniences with wi-fi, Netflix, SHO and HBO. This is a secure setting with private courtyards and a garage for your vehicle. The pool is open mid April for swimming, the beach below known for it's sea glass and hot springs that are available at the lowest of tides. You'll walk into town to eat on the Malecon which has the best fish and shrimp tacos! It's up to you if you want an active vacation or come to relax in this beautiful Oasis and enjoy life in a quiet little fishing village. So close to the center of town with unobstructed views. Secure courtyard setting and private garage for your car. The best location for exploring the area or just relax on the private patios or enjoy the sandy beaches below. Kayaks are available for you to use and hiking nearby. Its an easy walk to town for tacos and shopping. The best location in San Felipe. The front deck juts out over and above the beach giving you total privacy. Private staircase to the sandy beach below. All the essentials for light cooking and an easy vacation. Absolutely stunning! The sunrise was magnificent! We had an amazing stay! Super hosts. The 2 bedroom home is beautifully decorated and we didn’t want for a thing (except more time to spend here). The beach is clean and sitting on the deck is so relaxing listening to the waves. We’ll be back...and bringing friends next time! Gail and Michael maintain their properties and grounds in immaculate condition. Upon arrival Gail opened the garage and that's where the car stayed until we left. To offset the hours we spent lounging on the very comfortable verandah chairs, listening to the gentle lapping of the Sea of Cortez waters mere yards away we walked to the shops and restaurants. One restaurant in particular caught our attention. "Baja Mar" I think was the name. The fish dishes we enjoyed there were excellent. On our way home we stopped off at relatives in San Diego for a few days and by the time I was home and at my PC I saw that Gail had already processed my security deposit. They are terrific people to do business with and we recommend them and their condos highly. I drove down to San Felipe from Los Angeles with my girlfriend and we had so much fun during our stay. Michael and Gail were such a pleasure. They took care of everything we needed. They had atvs delivered to us, and had a sailboat pick us up right on the beach in front of the condo. The condo itself is loaded with high-end amenities. It has beautiful stone tile flooring with Brazilian granite throughout. There is a smart Samsung TV with cable and the unit also comes with high speed internet that always worked. It even has a washer and dryer in the unit and private garage that can fit two vehicles. The views from the balcony over looking the Sea of Cortez are spectacular. We woke up early every morning to watch the sunrise. We fell in love with this sleepy beach town and can't wait to go back. Gracious hosts who will give you tips on where to go and what to do. Loved seeing the sunrise every morning. The property was incredible, it was like living the luxurious life. It was a calm and relaxing experience, it's a place where you go to unwind and relax. The private beach was incredible, the water was nice and warm. The sunrise and sunset was a view! Definitely a place to consider if you're trying to get away from the city. Mr & Mrs. Gates were nice host, nice people and I would definitely recommend to book from them. Their condo homes are very nice!! My friends and I had a good experience in San Felipe, one we won't forget! Gail and Michael have a beautiful complex and the stay in the unit was perfect. They welcomed us with a cool room, chilled drink and dinner recommendations. The amenities were high quality. We had private beach access to a lovely beach and the use of the lap pool. The complex is quiet and private. Felt like we were by ourselves. The malecon is about a ten minute walk away. San Felipe is a quaint fishing village with friendly people, shopping and restaurants. Plenty of activities such as hiking, ATV's and exploring the beach and desert. This is our private guest house and a retirement community. All age adults are welcome, just be considerate neighbors and take security seriously. All guests on the property must be registered.